Adam Adolfo, Bradly Brown, and HOMECOMING! Committee are this year’s winners. 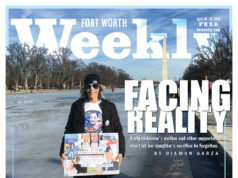 Fort Worth Weekly is not an advocacy mag, unless you consider exposing sources of anti-truth, anti-liberty, and anti-justice some sort of biased mission. But we do enjoy pointing readers in the right direction. For more than 15 years we’ve been turning Fort Worthians on to the best music in their backyard via our pages and our annual Music Awards Festival, a free all-day block party whose most recent incarnations have featured 48 bands (all from Tarrant County) in six venues. 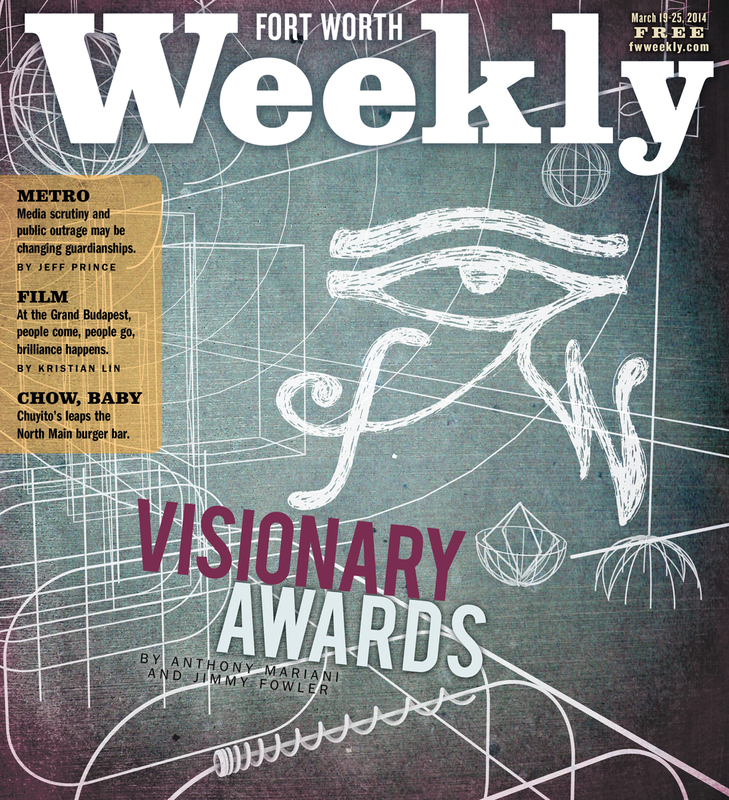 And for the past four years, we’ve been celebrating the best local visual artists, actors, directors, and more through our Visionary Awards. Created simply to give back, the Visionary Awards include a $500 cash prize per winner and, of course, some publicity, a hot commodity in a media market dominated by Dallas and by touring events and personalities. For our 2014 edition, our nominating committee (comprising nearly 30 local art-world folks) did something unprecedented and chose a theater person, Adam Adolfo, as a recipient. “That’s very humbling,” Adolfo said. Joining the producer/director as winners this year are multimedia artist Bradly Brown and the 13-member art collective HOMECOMING! Committee. All three winners join previous Visionaries Michelle Brandley, Lauren Cross, Andrew Disney, Tim Harding, James Lassen, David Patrick Lowery, Frank Mosley, Devon Nowlin, and Micah Yarborough as representatives of some of the best, most progressive art coming out of the great 817. And going … beyond. The 2014 winners will be feted from 6 to 9 p.m. on Thursday, April 17, at Artspace 111 (111 Hampton St., 817-692-3228) –– admission is $20 per person or $30 per couple and includes free booze and food. (We’ve done the math, and three hours of partying at any other place in town is going to cost you a lot more than what we’re offering.) Get your tickets now at Spunetickets.com. Congratulations again to Adam Adolfo, Bradly Brown, and HOMECOMING! Committee –– and to all of you for your readership and support. See ya April 17 at Artspace. –– A.M.
Brown was just wrapping up his photography degree from the University of North Texas and essentially had to scramble to take advantage of the opportunity to exhibit at Conduit, one of the most prestigious and forward-thinking galleries in Texas. Brown hasn’t let many opportunities pass him by since then. 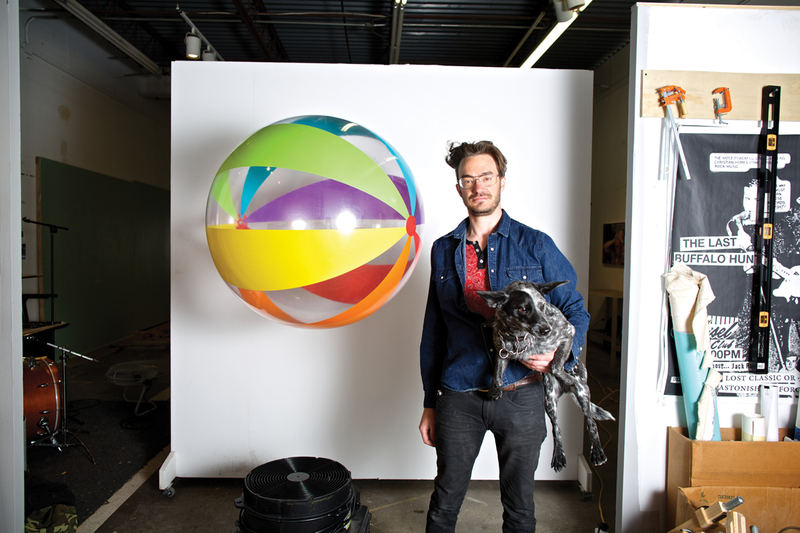 A recent graduate of the master’s program at Texas Christian University, where he has been teaching for two semesters, the 34-year-old El Paso native is one of the brightest lights in North Texas’ burgeoning conceptual art landscape. His work pivots on the intoxicating combination of headiness and lightheartedness. One of his most memorable pieces is “Attention Retention,” three everyday multicolored beach balls held aloft by three strategically placed electric fans. Another novel composition is Beastly Words, a series of drawings of objects (a zebra, a tiger, track runners, a WWII fighter plane) using film negatives of printed words recovered from a university trashcan. Brown grew up in an art-loving upper-middle-class family, the younger of two children. His father was an architect and his grandfather made custom dress shirts for Mafiosi in New York City. “At least that’s the legend,” Brown said with a chuckle. Brown developed an affinity for art at an early age. Instead of being enraged after young Bradly had drawn all over the walls in the house and colored his stuffed animals, his parents encouraged him. “That’s a huge reason I am where I am,” he said. As a teenager, Brown became heavily involved in playing music, specifically proto-punk rock. “Being in a band [was] to get girls, basically,” he said. Along with The Velvet Underground records that his older sister turned him on to, Brown was also influenced by “slowcore” artists such as Slowdive, Jawbox, and My Bloody Valentine and also early emo music (Built to Spill, Cap’n Jazz, Joan of Arc, anything from Thrill Jockey Records). A drummer with no formal training, Brown found a home in the El Paso music scene. “I went to several different schools,” he said. “My social community was completely based out of the music scene … which was very strong and supportive and close” and which produced one of the biggest bands of its kind in the country, At the Drive-In. Brown continued pursuing music after relocating to Denton, whose still-exciting scene was one of the reasons he chose to attend UNT. His de facto headquarters was Rubber Gloves Rehearsal Studios, whose owner, Josh Baish, is from El Paso and had gone to high school with Brown’s sister. Brown eventually worked his way up from janitor to bartender. “That was a great saturation in creativity and music and people I wanted to be around,” Brown said. Around graduation, Brown had become deeply involved with his band at the time, Oceanographer. And with “very little” money in his bank account, he and his four bandmates packed up, picked up, and relocated to Brooklyn. “We all just decided to move up there together and see what happens,” Brown said. Working in the music industry reinforced his decision. “Seeing how the music industry worked, eh, I wasn’t really into it,” he said. Having always wanted to teach, Brown chose to pursue his MFA at TCU after chatting with a trusted friend who was in the program at the time and loving it. “I knew there was a community that I was familiar with and that was established and respected,” Brown said. Brown was recently awarded a $5,000 scholarship from Mercedes-Benz Financial Services. After opening a Fort Worth location in 2008, the Michigan-headquartered company created a joint partnership with the art schools of TCU and Southern Methodist University to honor one student from each program annually, beginning this year. 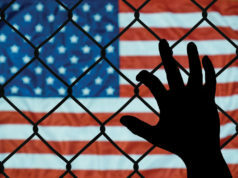 Along with six pieces from SMU’s winner, junior Diana Antohe, two of Brown’s artworks are now on display in the company’s building near Alliance Airport. His other Mercedes-Benz piece is “Transpacific (a line drawn from Texas to Japan),” an assemblage of the word “Chorioactis” written in cursive white letters on blackened paper, suspended above a pile of pencil shavings on the floor and, on a shelf, 194 No. 2 pencils reduced to nubs. Created for an exchange program between TCU and Hiroshima City University, “Transpacific” is not as much about visual audacity –– striking though it is –– as it is about context. The mushroom Chorioactis, known as “the devil’s cigar” or “Texas star” in the United States, is found only in select locales in Texas and Japan. “This piece of endurance is meant to reflect the distance traveled by the mushroom’s spore cloud between the two countries, mirrored by the movements of my hand,” he wrote. In New York City, you’ve basically got to be a billionaire to have your own studio. Not so in Fort Worth. “I don’t think it matters where you live as long as you’re doing something interesting,” he said. 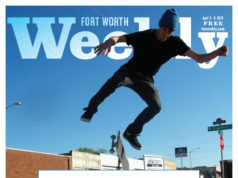 “But in comparison, Fort Worth has a ton of inexpensive property that allows for amazing studio space. I think both cities have pluses and minuses, but it’s more interesting to me to work in a place like Fort Worth because it has such a young contemporary art scene, and it feels like you can be part of its development.” –– A.M.